Is that from the Egyptian Book of the Dead??? I loved that info and i used it in my report for school! :) Thx!! very good but correct me if im wrong (which i probably am) but when the pharaoh's heart is weighed, is it then that the question's are asked? Indeed ammut has real life basis, but you would have to be a mystic to encounter it. 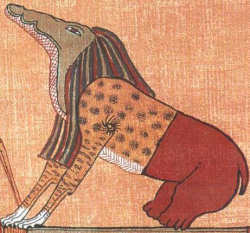 Ammut was a chimera of the 4 man eater of the egyptian kingdom: the crocodile, the lion, the hyena/leopard, and the hippopotamus.